I love this time of year in southern California. The trees are bursting with citrus fruit. When my neighbors show up with bags full of lemons, oranges and grapefruit I just wanna cry I’m so happy to get them. Citrus fruit are in season during this winter months (for the US) This time of year you’ll buy the sweetest grapefruit, juices oranges and my favorite cara cara oranges! 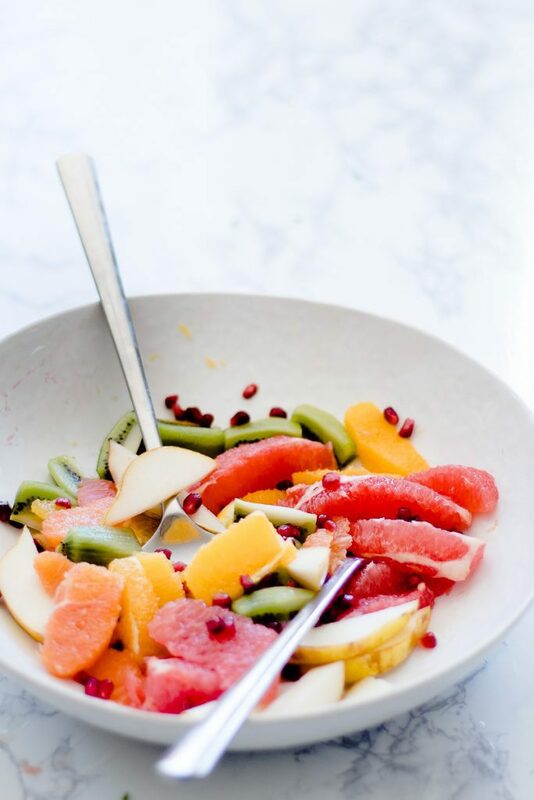 Making a fruit salad out of these beautiful fruits can kind of be tricky, so I’m helping you out with how to make the best topical fruit salad. 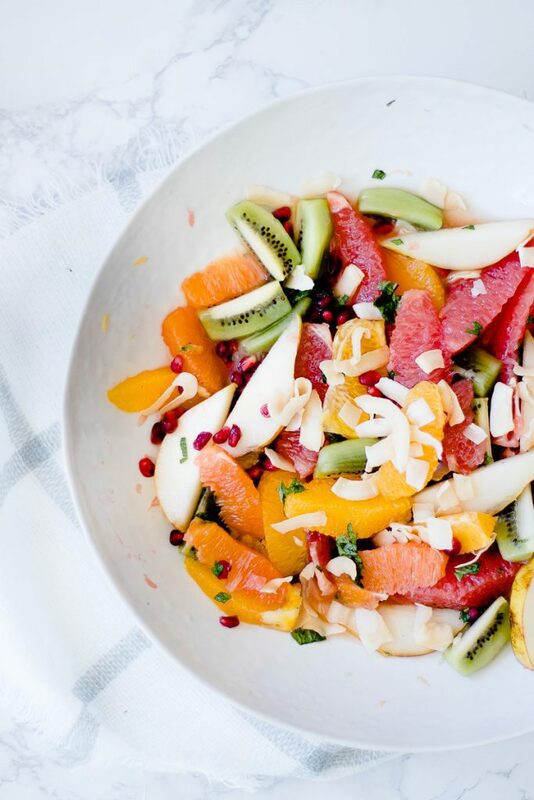 Not only are oranges,grapfruit, lemons and limes in season- but also kiwi, pears, pomegranates. I love to take advantage of their lower prices and they seem to taste just so much better. 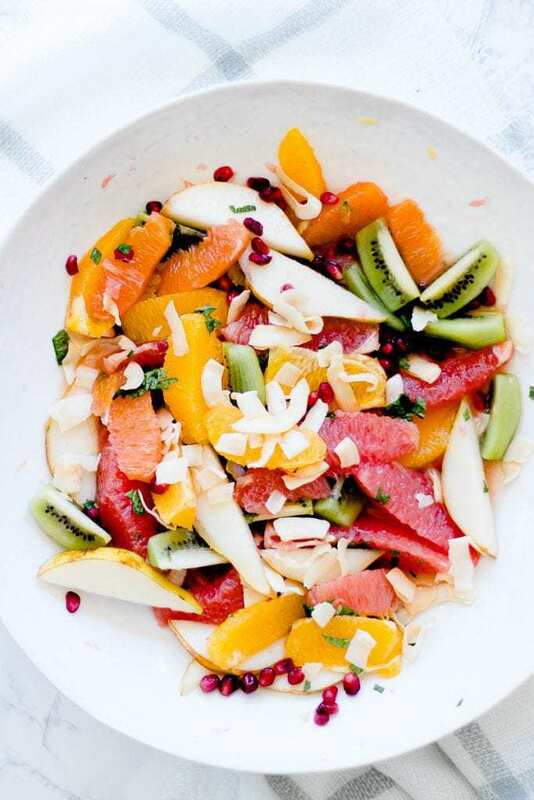 When making a tropical fruit salad you’ll need your fruit cut into segments. The beautiful thing is that its pretty fast and simple, in fact you may never go back to eating a grapefruit any other way. 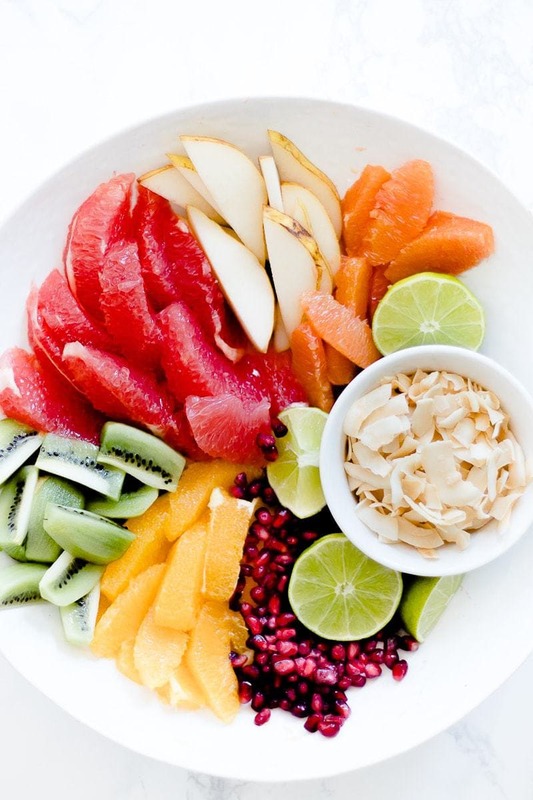 Cutting citrus fruit into segments also gets the most meat out of the fruit as possible. You can watch a full tutorial on how to cut below these instructions, and above the recipe. 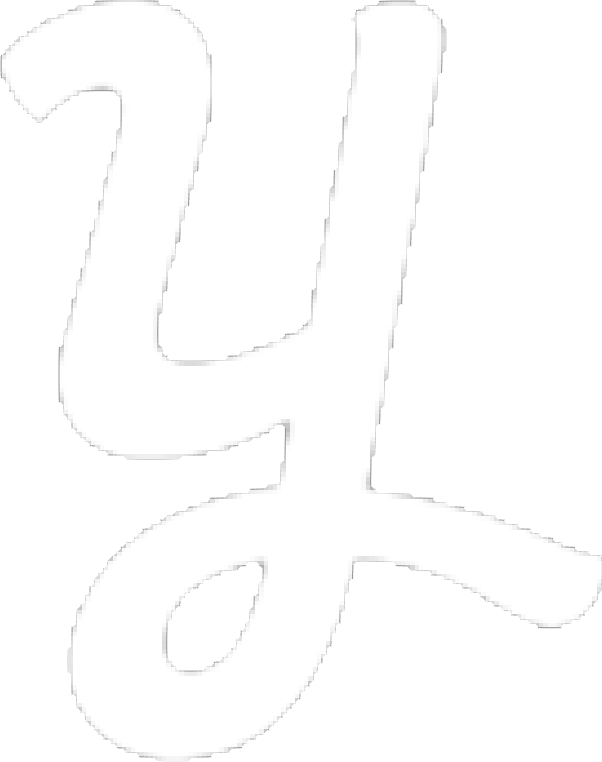 You’ll want to start but cutting off both ends. setting the grapefruit on the flat ends cut of the rind slicing from top to bottom all the way around. Turn the grapefruit on its side and slice between the membranes. pull out the segments! 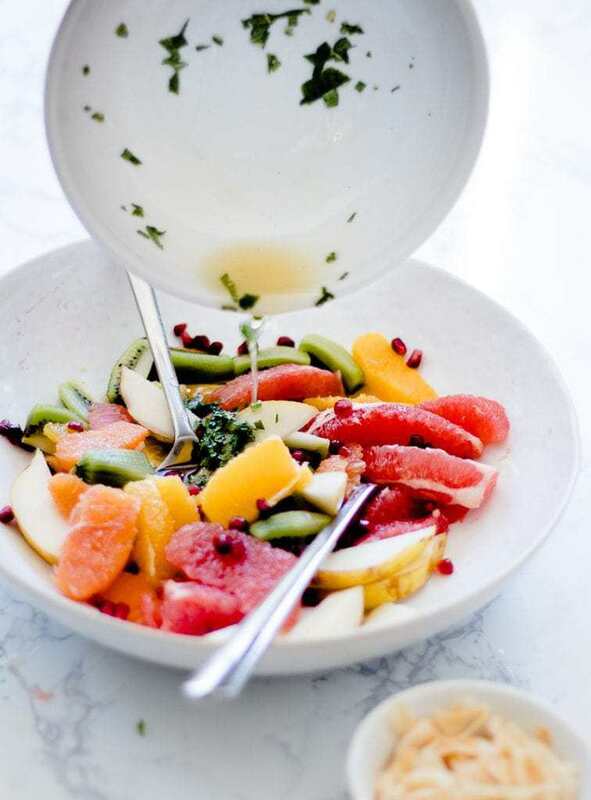 Now that you have the fruit sliced we can finish off the toppings. I love to make a mild sweet syrup to lightly toss on top of the fruit. It’s made of lime, honey and mint. 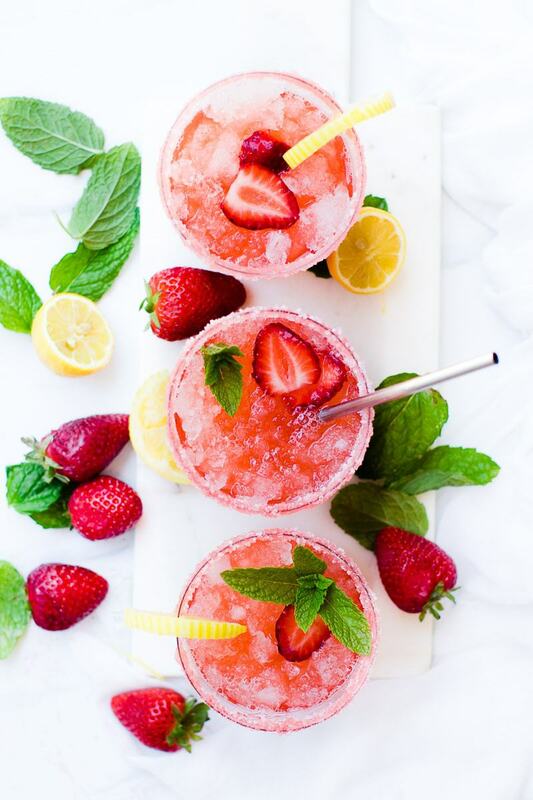 These flavors enhance the natural flavors of the fruits. 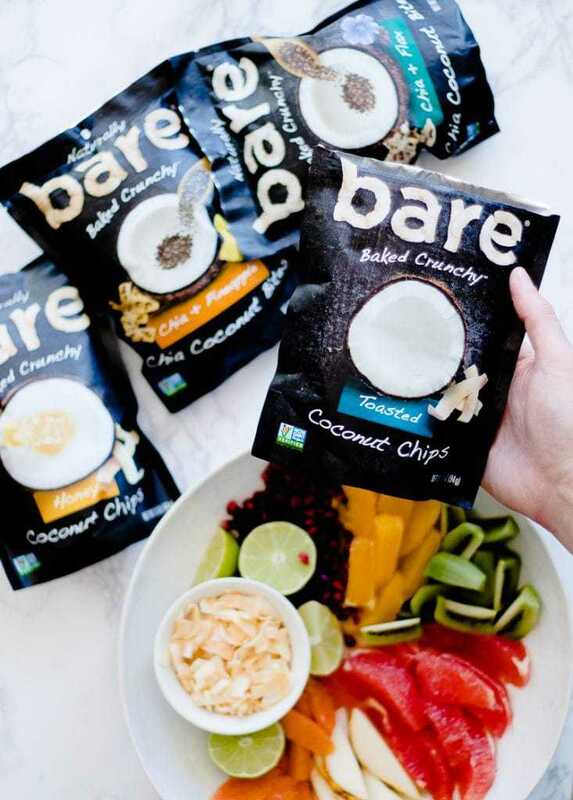 The last topping that will push this salad over the top are these sweet and crunchy coconut chips by BARE. I’m obsessed with them. They’re one of my favorite snacks. and they pair perfectly with the tart flavors of the citrus fruit. They have a few different kinds of coconut bites, and they would ALL work so you can pick out your favorite to top with them. The coconut chips pictured is the toasted flavor. 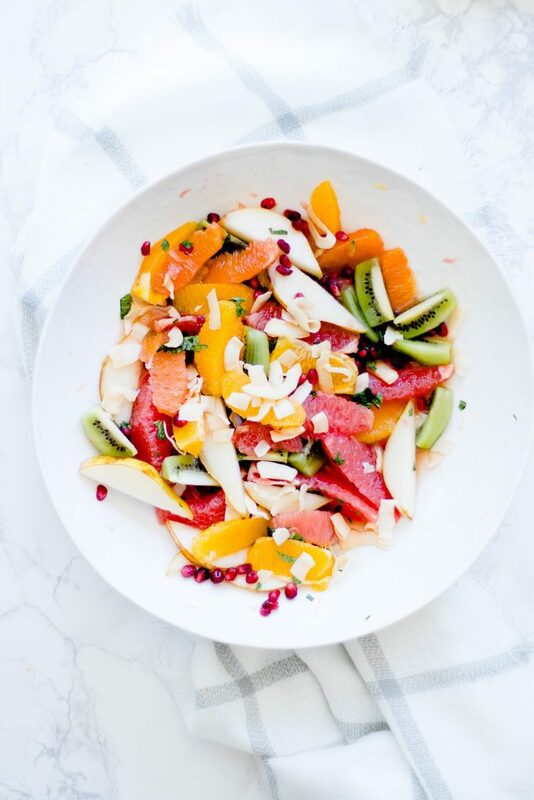 You can totally make this salad a head of time, in fact it will be better to let the mint and lime marry with the other fruity flavors. Let it chill in the fridge until its ready to serve. Do not add the coconut chips until right before serving. You want them to remain nice and crunchy, if they are put on too soon they will soften. I like to serve additional coconut chips on the side too- because EVERYONE loves to snack on them and more to their salads. 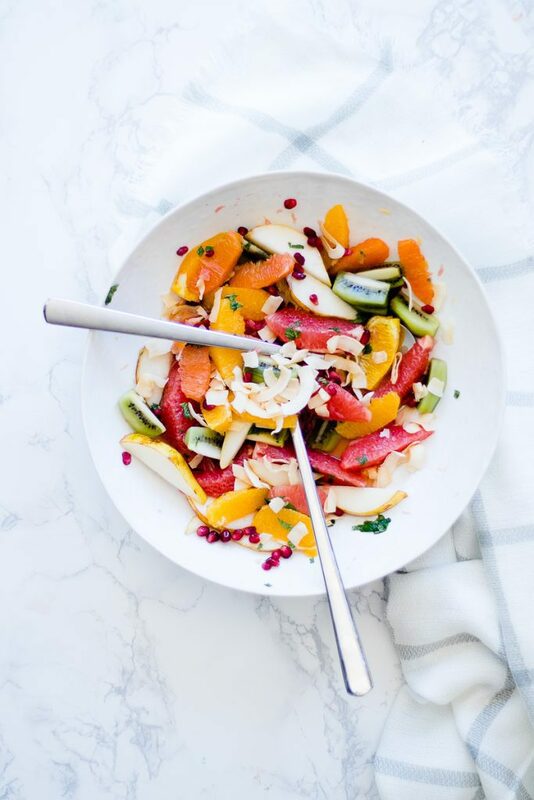 A fresh summer salad that takes you straight to citrus town. 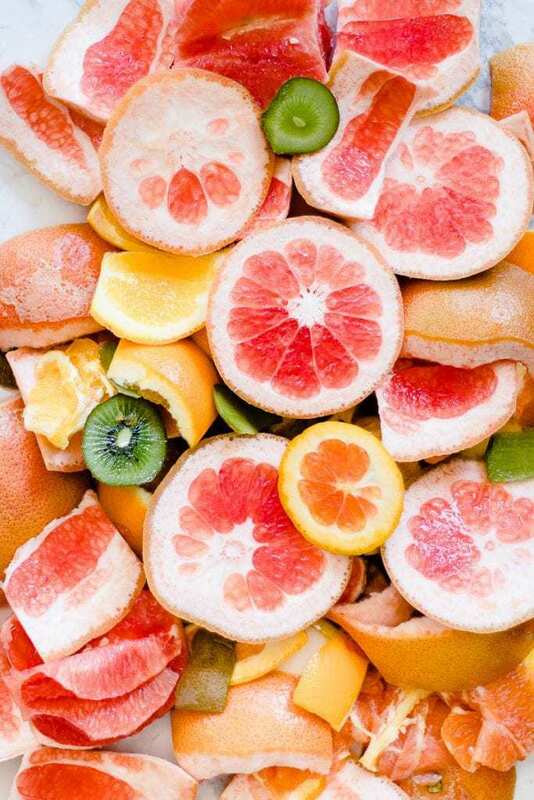 Segment oranges and grapefruit. Instructions are in post and video. Add all to a large bowl. 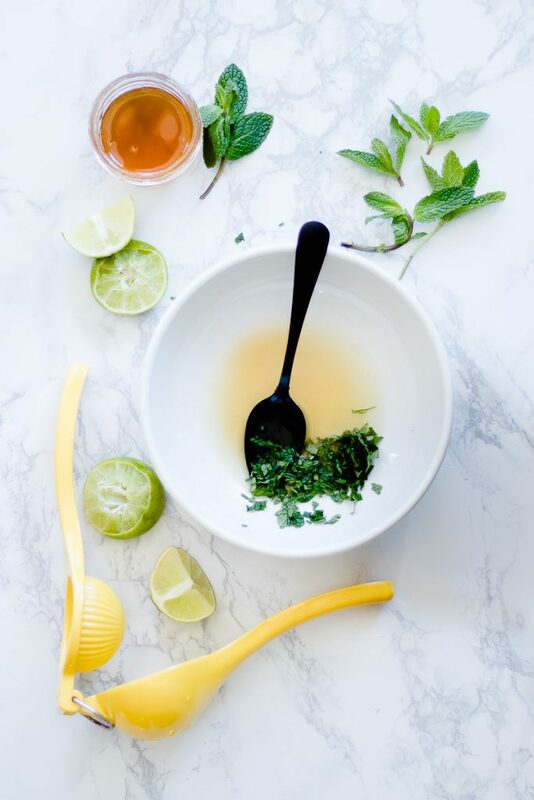 In separate bowl juice limes, chopped mint, and honey. stir until honey is dissolved. 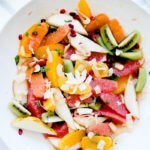 Top on tropical fruit salad and lightly toss. Chill. Top with coconut chips right before serving. Am I missing something–I don’t see the recipe? Ah lisa! Thanks for letting us know.  We recently made some blog changes I guess some recipes were lost in the change. We will get right on it! Such a yummy salad! Totally made me feel like I was on an island.